Create a mobile office with the support of a global leader in scanning solutions. Built with performance at its heart, the Epson mobile business scanner range is the ideal solution for field workers and agile working environments. 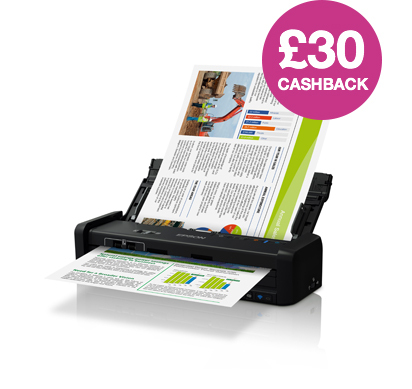 Purchase a selected Workforce portable scanner between 01.01.2019 and 31.03.2019 to claim up to £30 cashback*. Purchase a selected Epson Workforce portable scanner between 01.01.2019 and 31.03.2019. Complete the online claim form within 30 days of purchase and by 31.03.2019. Upload a copy of your receipt and submit your registration. You will receive your cashback once the claim has been verified. * Portable Scanner Cashback terms and conditions apply. ¹ Compared to Personal Mobile Scanners as defined by Infosource for EMEA region and based on competitors websites data to June 2016.